Top Democrats, Reps. Nancy Pelosi (D-CA) and Elijah Cummings (D-MD), called on Attorney General Jeff Sessions to resign over undisclosed contacts with Russian Ambassador Sergey Kislyak. Sessions had two rendezvous with the Russian diplomat, one of which occurred in September of last year when the interference campaign conducted by the Kremlin was reportedly in full swing, according to The Washington Post. The other time was in July. During his confirmation hearing in January, Sessions admitted that he's been called a surrogate for the campaign a few times, but did not have communications with the Russians. It was in response to Sen. Al Franken's (D-MN) question about what he would do as AG if evidence of Trump campaign surrogates having contact with the Russian was discovered. Sessions was also asked by Sen. Pat Leahy (D-VT) in a letter if he had any contact with the Russians about the 2016 presidential race either before or after Election Day. Sessions answered no. Then-Sen. Jeff Sessions (R-Ala.) spoke twice last year with Russia’s ambassador to the United States, Justice Department officials said, encounters he did not disclose when asked about possible contacts between members of President Trump’s campaign and representatives of Moscow during Sessions’ confirmation hearing to become attorney general. The Post added that they asked the 26 members of the Armed Services Committee to seek whether any of them, besides Sessions, had contact with the Russian ambassador in 2016. Out of the 20 who responded, including Sen. John McCain (R-AZ), none of them met with the Russians. That still leaves six who haven’t responded yet. 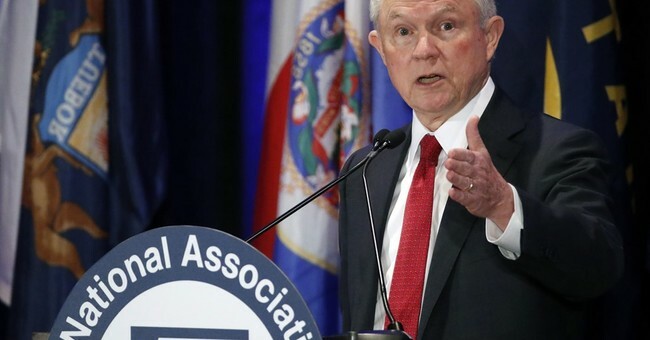 The publication also added that Sessions’ July meeting was at a Heritage Foundation event in Cleveland, where 50 other ambassadors, including Kislyak, attended. The Alabama senator spoke with some of the diplomats one-on-one. Kislyak was one of them. The outcome of the inquiry, and whether it is ongoing, wasn’t clear, these people said. The contacts were being examined as part of a wide-ranging U.S. counterintelligence investigation into possible communications between members of Mr. Trump’s campaign team and Russian operatives, they said. The Federal Bureau of Investigation, which has been leading the investigation, didn’t immediately respond to a request for comment. The White House directed requests for comment to the Justice Department. “If there is something there and it goes up the chain of investigation, it is clear to me that Jeff Sessions, who is my dear friend, can not make this decision about Trump,” said Sen. Lindsey Graham (R., S.C.), adding that a special prosecutor might be needed. The law has changed since wide-ranging probes into the Clinton Administration, when a three-judge panel could appoint an “independent counsel” or a “special prosecutor.” Today, the attorney general retains far more control over the scope of a special investigation and its prosecutorial jurisdiction. Mr. Sessions can also appoint a temporary “special counsel” from outside the Department of Justice to conduct an investigation into a particularly sensitive matter and possibly prosecute related wrongdoing. Some are noting that it’s a) nuts to suggest that a meeting in Sessions’ office and a rendezvous at a Heritage event are evidence of subversion of behalf of the senator; and b) he answered Franken and Sen. Pat Leahy’s (D-VT) questions about Russian contact truthfully. Leahy asked about contact with Russians concerning the 2016 election, whereas Franken’s question related to campaign surrogates. As we let this settle, Sen. Elizabeth Warren (D-MA) has called on Sessions to resign. Leahy asked about communications about the election. Franken asked about communications as a campaign surrogate. Sessions told the truth. I didn't like Flynn - a hothead with red flags. I disagree with Sessions on a ton of issues. But this is straight up nuts. UPDATE: Attorney General Sessions responds, saying he never spoke with Russians about campaign issues. “I have no idea what this allegation is about. It is false,” said Sessions.